The later 70s weren’t a prolific time for deep soul – musical tastes had changed radically since the Golden Age of soul. So it’s a pleasure to come across little gems like this one from New York. 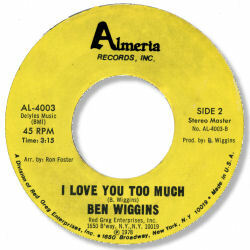 Wiggins' crying tone and rather wavy vibrato give I Love You Too Much a quiet poignancy, and although there is no horn section, the sympathetic playing of the drummer, guitarist and pianist more than make up for the omission. This came out on a subsidiary of Greg Carmichael's Reg Greg records, a label highly rated for it's disco/dance material but this disc fortunately sounds like a song written by Sam Dees during his time at Aware. Pretty high praise. UPDATE ~ I'm very pleased to say that Mr Ron Foster, who arranged "It's All Over" has written to me to mention two unrleased tracks that Ben Wiggins recorded with him, called "You're darn right awful nice" and "Let bygones be bygones" which were recorded in 1979. He says that Ben is a bit of a mystery. "Don't know much more than Ben coming to my studio from Newark New Jersey rehearsing some of his original songs and eventually recording them at Coordinated Sounds in New York (Manhattan). Unfortunately never took any pictures of him but he was a flashy dresser with hat and jewelry." Mr Foster was kind enough to send me an MP3 of "Let bygones be by-gones" and the song is a fine uptempo number with a strong melody with more than a hint of disco in the beat. Fans of that fine rare LP by Lee McDonald called "Sweet Magic" will recognise Ron Foster's name as the arranger and producer of most of the cuts. I'm very grateful to him for getting in touch.